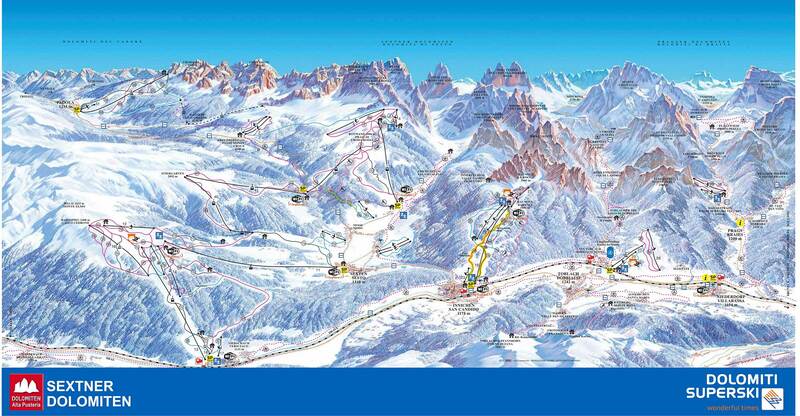 Dobbiaco is a perfect destination for your ski holidays in Italian Alps. Here you can be fascinated by the wild beauty Val di Landro offers. In addition Dobbiaco ski resort offers wide range of activities, for example, the famous cultural highlight - Gustav Mahler Music Weeks. Dobbiaco as well is the venue for several cross-skiing competitions. Dobbiaco ski resort is located in Northern Italy right beside the border of Austria. The resort is located between two beautiful nature parks in very romantic Höhlensteintal valley. The ski resort does not have long line of history, but it is becoming more popular today. Dobbiaco is perfect for romantic getaway as well as peaceful ski holidays with all your family. Transfers can then be arranged to take you on to the resort. Factors mentioned above will result in our base-rate for ski transfers going down – we never over-price our services at any time or for any reason. We love to offer our clients substantial discounts for off-peak, off-season and midweek transfers to Dobbiaco. If looking for the biggest savings, travelling outside peak season or midweek will result in the biggest discounts. We offer midweek (Monday to Friday) prices with up to 60% discount from the weekend prices. If you have any specific requirements or will be travelling as part of a larger group, please get in touch directly so we can discuss this. Dobbiaco is famed for providing an equally incredible experience for all skill levels across the board. From first-timers to seasoned pros, there’s plenty on offer for everyone. Dobbiaco is one of the most friendly and entertaining resorts for families with kids of all ages. There are professional ski schools in the area and plenty of tender slopes for introducing kids to winter sports. If you are booking a transfer to your resort destination, there are some aspects you may need to know. It is all about high quality services, which will ensure the great and peaceful start of your ski holidays. Transfer company Alps2Alps will offer you complete service package of quality, reliability and value for money. We advise you to book your transfer as early as possible to take full advantage of maximum availability and the lowest possible prices. If you you are looking for the resort or service you require and can’t find it on our website, get in touch with Alps2Alps team and we’ll do our everything to help you. Great trips to Dobbiaco start with the best transfers – let the experts at Alps2Alps show you the way!